From Bo’s humble beginnings as lead singer of the two other well-known groups, The Dramatics, and Lakeside, Bo joined the legacy of another super group that has a star on the Hollywood Walk of Fame, has sold over 60 million new records, has members in the Rock and Roll Hall of fame, a group that has toured the world many times over, The Temptations. This group consists of seasoned singers who have toured not only with Barrington, but with former lead singer of the Temptations, Grammy Award and American Music Award Recipient Richard Street and the late great Ollie Woodson. This unit has gained the valuable knowledge and experience to legitimately present this cherished music to the masses of Motown fans all over the world. 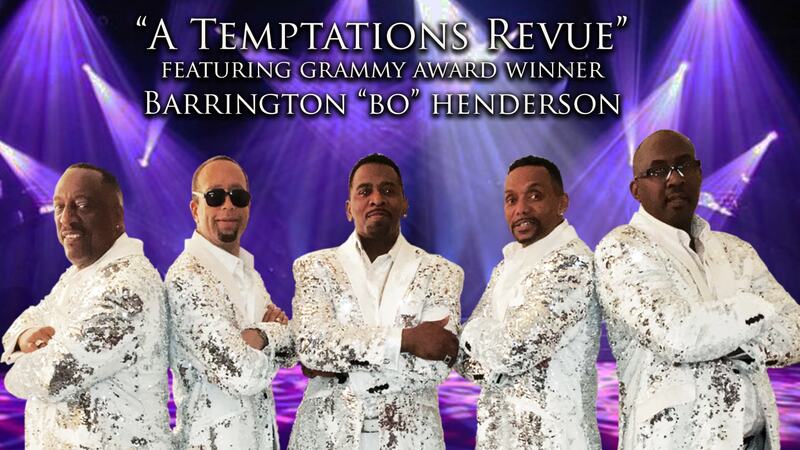 Bo’s amazing vocals and stage persona cannot be matched by any other group out there today paying tribute to the greatest music ever written and performed by the Temptations. The group is poised to deliver consistency to their audiences show after show and once you see this show, you and your audiences will be begging for more!